The fifth module coming to Neverwinter will be Rise of Tiamat, which will be a continuation of the story coming from Tyranny of Dragons. Tiamat, the five-headed draconic goddess from the Nine Hells, is on the verge of resurrection from the Cult of the Dragon. The city of Neverwinter, which has come under siege during the Siege of Neverwinter event, which is both part of Tyranny of Dragons, Neverwinter's forth module, and Season of Dragons, the ongoing event happening through the rest of the year. This is announced at the same time that Wizards of the Coast is announcing a Rise of Tiamat module for Dungeons and Dragons tabletop, as well. The release date for this will be October 21, 2014. 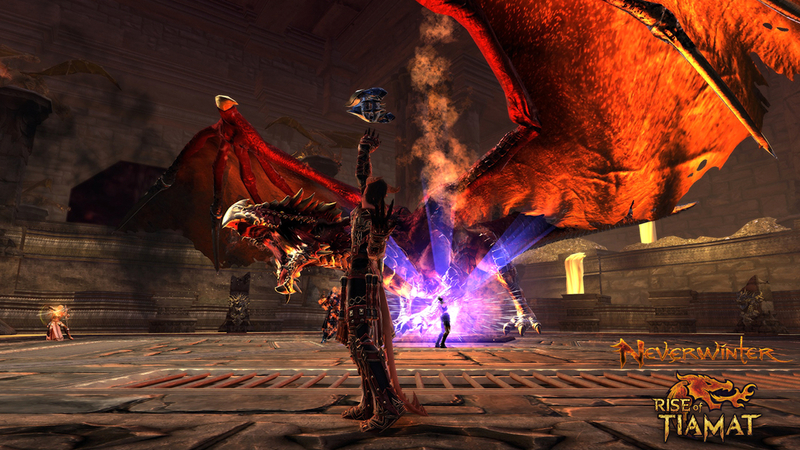 The Neverwinter module currently does not have a release date, but we will report on it as soon as that is known. Will we see simultaneous releases of Tiamat in Neverwinter and Dungeons and Dragons or will one be a spoiler for the other? Does this crossover mean that we'll have storylines written by Wizards of the Coast? Want a teaser for where the story will take us? Cryptic has released a Rise of Tiamat story trailer to give an overview of what to expect. If you need help getting caught up, be sure to check out our announcement for Tyranny of Dragons coming to Neverwinter, Jeff's hands-on experience with the forth module, and the announcement for Season of Dragons starting, which also announced the newest class in Neverwinter, the Scourge Warlock. Speaking of the Scourge Warlock, it will be receiving a new paragon path with the Rise of Tiamat. This path will give players of the class additional ways to play the Scourge Warlock, both in group and solo situations. Not playing a Scourge Warlock? If you're a high level player, you will have new artifact gear to look forward to. The opportunity to collect these new pieces comes just in time as players will need to gear up to prepare for the massive battle against a resurrected Tiamat. When Cryptic releases more information on what will be in the fifth module, we'll get those details published. Until then, let us know what you're enjoying (or not enjoying) about the forth module, Tyranny of Dragons, the ongoing events, Season of Dragons, and the newest class, the Scourge Warlock.